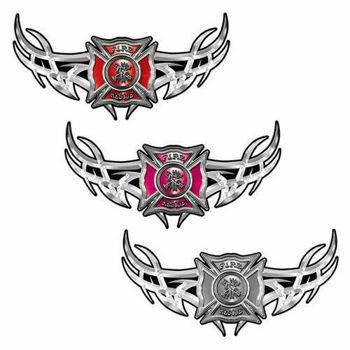 Tribal Wings with Fire Rescue Firefighter Maltese Cross. Unique design that will work just about anywhere. Sold as a single decal / Sticker Kit. Our new 7 Color translucent ink process makes all of the color of this graphic reflect with the reflective option and we now offer this graphic in a special canvas like interior wall decal. The Reflective decal options are produced using a 7 color highly detailed graphic on high-performance retro-reflective vinyl with engineer grade quality that meets the ASTM 4956-99 specifications. The Interior Wall options are much like wall paper but with the adhesive already to go. The interior graphics will not pull the drywall apart if you ever want to take them down. They are not resuable but will not harm the wall. A great idea for the home gym or gift for any of your runner friends or family.